We're teaming up with Perricone for a third time for another giveaway. We're giving you the chance to win their Cold Plasma. Its a product to help enhance your current anti-aging routine through the power of biochemical individuality. Cold Plasma works so that your skin can extract from Cold Plasma’s formula according to your individual, unique needs. This personalized system, called biochemical individuality, is a self-selection process. It basically takes the ingredients that it needs and leaves the rest. Cold Plasma works through this system to deliver optimal nutrition to skin cells to help skin achieve a healthy, glowing, youthful appearance. It combats signs of ageness, such as blotchiness, wrinkles and dryness. To enter, just leave a comment telling us why you need this product. Winners will be picked randomly! Unfortunately, this competition is only open to US readers. But don't worry, I'm aiming to buy something from my holiday for a worldwide giveaway! The competition runs for 10 days, so will end on the 23rd of December. Keep checking on their website for other Perricone Code aswell. I can't wait for the worldwide give-away... something from Pakistan? That will be so awesome. Sorry, I'm just too presumptuous. Hahaha! great giveaway, i did the same one! Fabulous giveaway! Sign me up! Yippee! I am going to do this exact giveaway early next week, such a great product! I'd love to win this as a Christmas gift for my mom! She always had bright, soft and clear skin up through her 60s, but now age has caught up to her. She's been very stressed and struggling with family drama and financial issues, and aware how her youthful rigor and complexion is waning. There isn't much I can do to help since I'm a college student, but the cold cream can really restore my mom's beauty and improve her confidence. I had great skin until all of a sudden wrinkles started taking over :(. 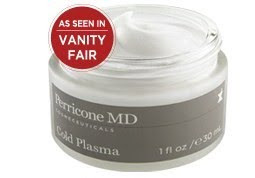 I've heard Perricone and Cold Plasma work miracles for wrinkles. I'd love to win this and try it out for myself!! I have tried Perricone MD stuff before and I really think it works!! Perricone has always had wonderful products, would love to try this out as well!